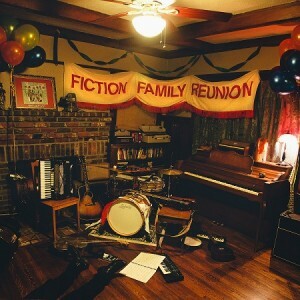 It’s been almost exactly four years since Fiction Family released their self-titled album, but fans of the group that started as a collaboration between Sean Watkins (Nickel Creek, Works Progress Administration) and Jon Foreman (Switchfoot) need wait no longer. Fiction Family Reunion, the sophomore effort from the group that now includes bassist, Tyler Chester, and drummer, Aaron Redfield, will be released via Alternative Distribution Alliance on January 29th, 2013, just as the band kicks off their two-month tour of the United States. While Fiction Family’s eponymous first album is full of dreamy indie folk pieces, Reunion isn’t afraid to cut loose and incorporates sounds that range from a Tom Petty style of heartland rock to unapologetically twangy country. The band’s second album does include some of the Beatles-inspired psychedelic folk elements of the first, but also brings in some indie punk flavor that is reminiscent of Ted Leo and the Pharmacists. Foreman and Watkins take turns leading with both vocals and lyrics that are pared down and honest without affectation or unnecessary frills, while the musical arrangements provide just enough layering to create a rich atmosphere without overshadowing the storytelling, which is what this album is really all about. As the first track, “Avalon”, opens, it’s as though you have suddenly found yourself in a theatre audience as the house lights are dimming and the curtains glide open. The boom-boom-clap, whimsical guitar, and background chorus instantly captivate and hint at the fantastic musical journey that is only just beginning. After getting your attention, “Guilt” grabs you by the hand and pulls you into a full-speed run with galloping guitar sequences and Watkins’ carefree vocals. Foreman’s soulful singing softens the energy with “Up Against the Wall”, an anti-ballad bearing a mix of salty sorrow and the subdued buzz of liberation that can only come from resigning one’s self to the tragedy of a complicated love. Foreman continues leading you through “Give Me Back My Girl”, an up-tempo folk-rock anthem, in which he belts out raspy confessions and demands that bleed a tempered angst and a nothing-left-to-lose attitude. Then, in another shift, “God Badge” opens quite unexpectedly with sounds that are inspired by the nursery music of a crib mobile or music box, gentle, melodic, and playful, before shifting into a more atmospheric and expansive tone. The repetition of the chorus soothes the listener into a dreamy trance and imparts the feeling of lying in the grass while staring into a star-filled night sky, getting further and further lost in the cosmos. Watkins takes the lead again with “Just Rob Me”, a manic square dancing song with a four-on-the-floor beat, lively banjo-inspired guitar, and spirited, slightly kooky lyrics that absolutely necessitate knee slapping and toe tapping. The album winds down with “Reality Calls” and Fools Gold” that create the sleepy, complacent lull of bar-goers at the end of the night, lingering for just a but longer, not wanting the night to end, but end it must. When it comes time to part ways with Reunion it’s difficult not to feel the wistful satisfaction that comes at the end of a story full of zany adventures and loveably imperfect characters. The journey may be over, but the fond memories remain.